With Skrill Money Transfer you can send money with zero FX mark-up to your own or to third party mobile wallet or bank account. The transfers are instant (1) and carried out in the recipient’s local currency. The service is available for both non-existing and existing customers. Now you can join our Skrill Money Transfer Refer-a-Friend programmeand enjoy lower transfer costs by inviting you friend and family! 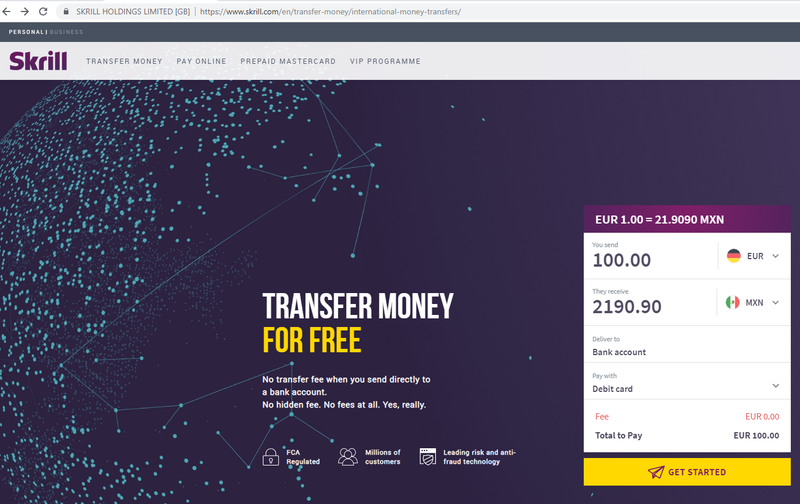 How do I send money using Skrill Money Transfer? Go to the Skrill Money Transfer page. Select the amount you wish to send and the recipient’s country. A real-time currency conversion rate will be displayed on the top of the payment request. This is the rate provided independently by Reuters. We do not add any hidden markup to this rate. Depending on the receiver’s country of residence you will be able to send money to bank account or mobile wallet or both. To complete the transfer, click on Get Started. You will be redirected to a Sign-up page – simply add an email, password and your personal information (first and last name, date of birth and contact details). The payment details provided at the beginning are stored and displayed next to the screen with your personal details. An option to Edit the transfer is available as well. After you click on Continue a FREE Skrill account (2) is automatically created for you. The currency of the account is the currency you have chosen when initiating the transfer. Next you will have to confirm who are you sending money to – to yourself or to someone else. Depending on the money transfer’s delivery choice (bank account or mobile wallet) you will be asked to provide the recipient’s name, bank account or mobile number. The details of the recipient are stored for future payments. Once you complete the transfer by choosing one of the available payment options a confirmation summary will be shown on your screen and sent to you registered email address. A list of your money transfers will be available under a section called “My transfers”. (2) The Skrill account created is a basic account and is subject to limits. To increase your transaction limits, you will need to verify your identity. Go to the Skrill Money Transfer page and fill in the transfer details (amount, recipient’s country etc.). You can access the Skrill Money Transfer service also by clicking on the banner within your Skrill account. 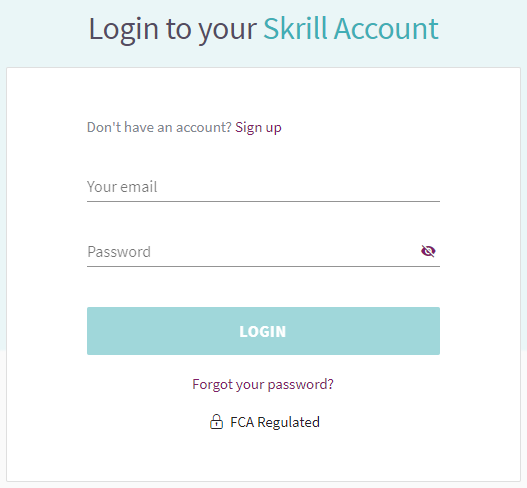 As you already have a Skrill account, login with your registered email and password. The pre-selected payment information will be saved and next you will have to confirm who are you sending money to – to yourself or to someone else. Depending on the money transfer’s delivery choice (bank account or mobile wallet) you will be asked to provide the recipient’s name, bank account or mobile number. The details are stored for future payments. Currently you can use your credit/debit card*, Rapid Transfer and Klarna as payment methods for Skrill Money Transfers. *US-issued cards cannot be used to fund Skrill Money transfer payments. The Skrill Money Transfers are carried out with zero currency conversion and funding fee. Please note that a separate fee might be imposed by your bank. How much can I send and how can I increase my transfer limits? There are some limits that depend on your funding method and transfer destination. You will be notified on-screen once you enter an amount that is higher or lower than the set limit. If you hold a new Skrill account verifying your identity will increase your limits. After receiving your funds, we aim to deliver your money instantly where possible, or within 24-72 hours depending on the destination option (mobile wallet) and funding methods you have chosen as well as the day of the week that you send the money. What currency does the money arrive in? The Skrill Money Transfer will be processed in the receiver’s local currency. Why cannot I use my Skrill balance with Skrill Money Transfer? Your Skrill balance needs to be kept separate for security and compliance reasons. Does the recipient need to have a Skrill account to receive money? No, a Skrill account is not required to receive money using our Skrill Money Transfer service. Can I send money to myself? Yes, you just need to enter your name and your bank details, or your mobile number. The process is the same as sending to someone else. What happens if my transfer via Skrill Money Transfer fails? If your card or bank deposit fails, you will receive an automated email with the transaction details. If your deposit was successful, but for some reason the Skrill Money Transfer fails, your payment will be refunded back to your card or bank account as fast as possible. To see the status of every transfer you make with Skrill Money Transfer check the “My transfers” section. Note: Please make sure you enter the recipient’s details correctly – phone number, IBAN, beneficiary’s names. Is it secure to send funds using Skrill Money Transfer? When you send a payment using Skrill, the recipient will not receive sensitive financial information such as your credit/debit card or bank account number. Can I set the amount that will be received? Yes, just tap on the They Receive field and you can set the receive amount. The amount you need to pay will then update automatically.